I had the opportunity to organise a trip to Peter Waterman’s excellent O Gauge model of Leamington Spa for the ORS. He and his team are attempting to re-create a model of both the GWR and LMS stations in the 1950’s. As he states, it is a British railway crossroads, although it is also where Pete started train spotting. It is huge and beautifully realised. From my pictures you will see much of it is complete, but other parts are work in progress. If you love model railways, and are offered the chance to visit, grab it with both hands. The above picture was taken by Chris Brennan and below are a selection of my own. As my regular readers will know, I am a little obsessed with the new Bullhead Rail from Peco. The next issue of Railway Modeller starts a series of articles on how to use the rail. I have spoken before about Peco’s new British code 75 OO track-Peco on the right track. I am really excited about it for a new GWR/BR(W) branch line. They introduced the flexible track first and now large radius points are available. But they are too large for my needs. I would prefer medium points. The points all use a type of frog that is new to the UK market-Unifrog. They are supposed to offer the best of insulfrog and electrofrog. There is a very good explanation of Unifrog in the Railway Modeller November 2017. Announced in March 2018 Railway Modeller, Peco is to soon introduce the crossing, single slip, and double slip, which is a bit of a surprise. The text also mentions medium radius points (hurah) later this year. I had better get my design buttoned down. (If the Peco web site was better organised, I would link to the landing page for Peco Code 75 Bullhead products, which Peco would change as more products were added). I have mentioned before that the London Transport Museum Shop released a model (commissioned from Bachmann) of it’s new S Stock underground train. Over the summer they released a display case for it. It consists of a free-standing perspex tube that holds a 4 car train (not a full 8 car train). This is a very good idea but they are asking £150 for it which seems very steep. If it had been available at a better price at the same time when I ordered my original model, I may have bought one, but not unless the price drops significantly. You can find it here. BTW They have released a differently numbered 4 car set and some single coaches to make up full 7 and 8 car sets found here. There is also lighting and sound unit available. This is self powered and lights 4 coaches but also makes a door sound if the unit is stationary for a few seconds. The world of model railways has taken some odd turns in recent years. The startup costs for a new model are huge so manufacturer’s have to make sure they will sell enough models at the right price to get their investment back. But now we also have model shops commissioning new models and therefore taking the risk. So who would think it was a good idea to model a unique 4 vehicle train that never saw revenue service-the APT-E. And what happened? It sold out! And now we have Rails of Sheffield commissioning Rapido Trains to make a one off coach, admittedly with a unique history. It is promised to be of a very high quality. At a time when a good quality RTR coach is £50, Rails will be asking £125 each. Yikes. The coach is part of Rails new high quality Exclusive range. One of the models represents the coach that recorded the record breaking run of the Mallard locomotive in 1938. Another model is the coach at the birth of British Railways and as used during the 1948 Locomotive Exchanges. There have been several high quality releases that garnered very high praise from reviews. We will have to wait to see how good it actually is and if it is worth the money. But the answer to the last question is up to you. The trouble with having a blog post that highlights an event, is that when that event has happened, your blog looks stupid. So here is a picture from a recent holiday in Scotland so I am not directing you to WycRail that has been and gone (Note to self, have replacement article ready to publish next year). I love Westerns and have a small layout based on an MPD in the Bristol area in the early 70’s so I have been collecting together a loco stable for it. I have a few weathered Westerns, but I wanted a really bad one-the sort that has been subjected to the care and attention of Laira’s washing plant a few too many times. So I bought a blue Dapol Western and sent it to Michael Doyle with some folding who then applied his considerable skills to ruin it-in the best possible way. 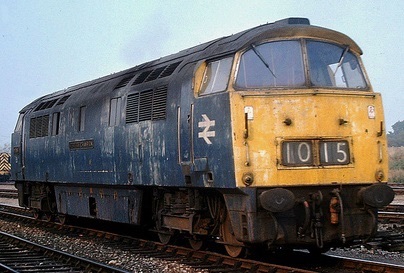 This is what the brand new plain blue Dapol Western looks like. And Michael went to work. And here is a picture in revenue work on his layout. I found Michael P Doyle on Facebook and he can be reached here. The prototype picture was taken by Philip D Hawkins and reproduced by kind permission. This is fantastic news. For those that don’t know, Peco’s biggest markets for their OO/HO track is outside the UK, so it is more HO than OO, and we have put up with that. At last they are producing OO track. The points will remain the same though. Perhaps if it successful, they will produce matching medium radius points in the future? God I should work for papers with headlines like that, but that aside Peco’s new announcement contains what a lot of us have been waiting to see for a while. Track to the standard of the models. I need Bullhead so depending on the release date I will use this and review it on top shed.